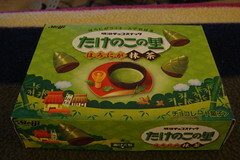 There are lots of Japanese snacks similar to this one, involving some type of cookie dipped in/filled with some type of chocolate, usually in a cute shape. I had never tried Takenoko no Sato before, but I think the Matcha one was a good place to start. These certainly are cute. The matcha chocolate on the outside had a nice flavor that was just a little bit bitter (a good thing) and just the right thickness to balance with the chocolate cookie. Actually, it seemed like the cookie was just a bit bitter as well, which was nice and not at all too sweet. The matcha white chocolate melted really well with the crunchy cookie, and my husband really liked that texture combination. 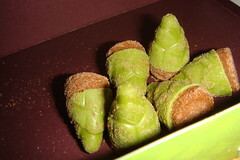 I think even those who aren't crazy about green tea could enjoy these snacks since it's got something else going on. They were quite addictive, as my husband and I finished them in one night. I would definitely try these in other flavors!